Pelikan’s Hub locations for 2017 are now available on their website. The data doesn’t reveal any big surprises and many of the same cities that we’ve seen in the past have again emerged as Hub locations. Others are absent, making room for a few new venues. Based on the available data, the fourth annual Hubs event continues to show steady growth. 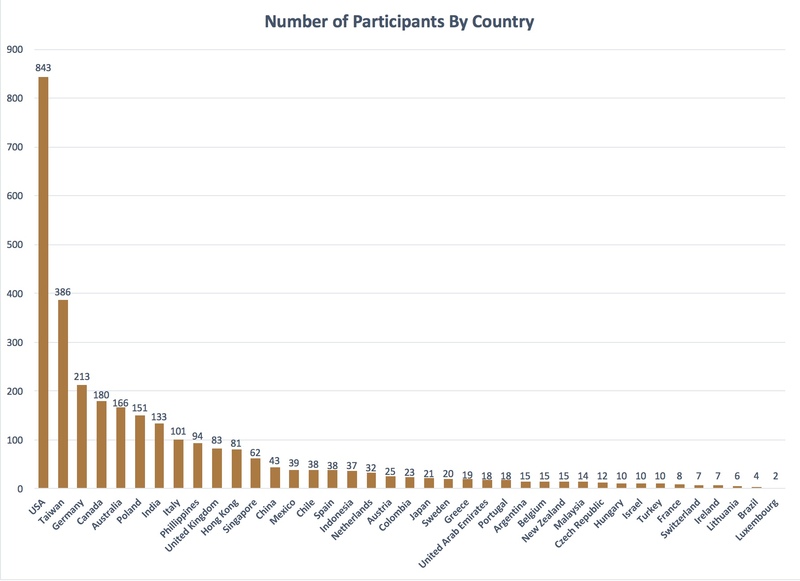 Each year has seen the inclusion of more countries, more cities, and significantly more participants when compared with the year prior. 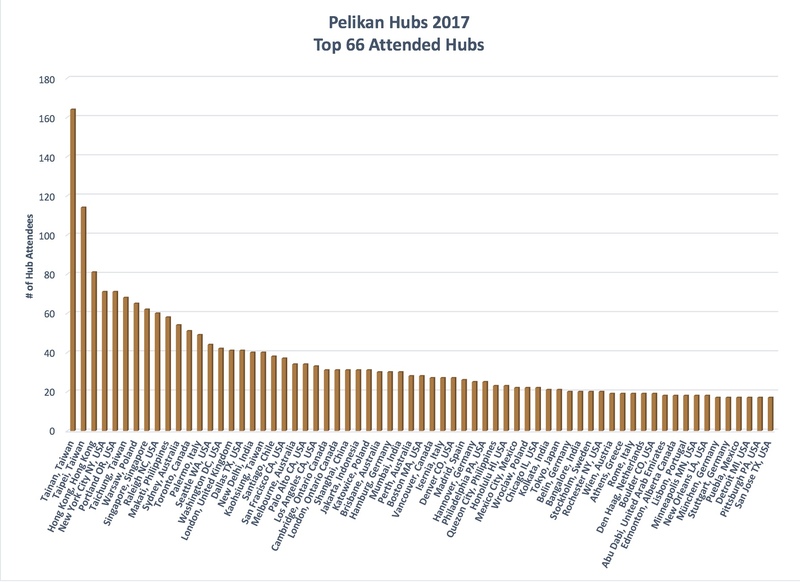 Based on the available data from Pelikan’s Hubs website (as of 7/7/17), this year’s event will span 131 cities spread out amongst 39 countries with 2999+ participants. Thus far, that represents roughly a 42% increase in attendance with time still left to register. For those not yet aware, this year’s gathering will take place on Friday, September 22, 2017 at 6:30pm local time. No details have been announced yet but prior years have included some excellent Pelikan swag for participants. Even though the locations are set, online applications for Hub Masters are being accepted until July 12th and general applications will remain open through July 17th. That means time is quickly running out if you want to be included in this year’s festivities. Attendance is by application only so even if you are unsure of your availability, I would urge you to submit an online application to secure your place and do the same for any friend/spouse/pen loving stranger that you intend to bring with you. Registration forms can be found here. If you cannot attend, you can easily follow along with the world-wide festivities via the hashtag #pelikanhubs on the various social media sites. 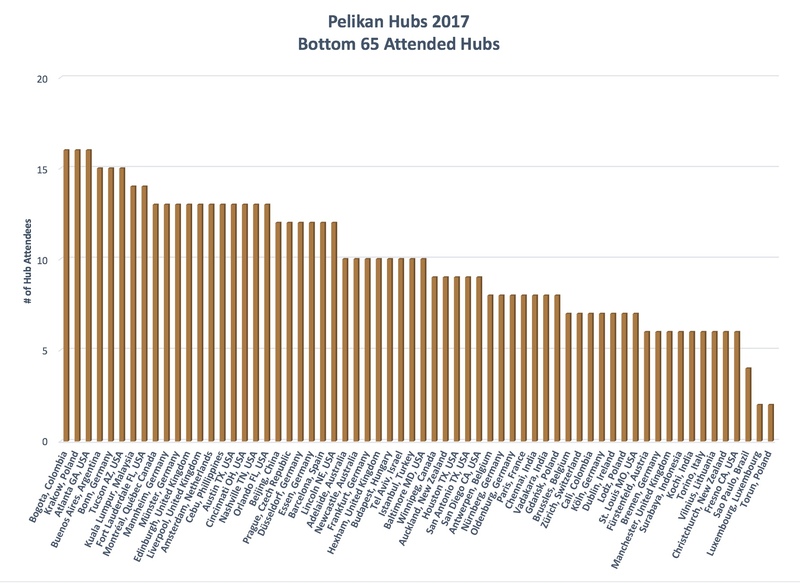 Check out Pelikan’s Hubs Overview for the most up to date locations and numbers of participants. Haha. Thanks for keeping me honest. Stupid geography. That would be California. Post updated. I saw that too, Rob… just assumed I didn’t know every town in Texas but it makes more sense now..🙂 These meetings always seem to fall on days when I am out of town on business and unable to attend which is always a bummer. I miss out on the swag and connections! Oh well… if they are still having these by the time I retire there may be a chance. Hopefully you’ll be able to get to one eventually. They are a lot of fun. Based on past success and continuing growth, I’m hopeful that they’ll continue to have this event for the foreseeable future. i’m counting the days. the first for Indonesia. Jakarta seems to have a good number of attendees lined up. yes. not bad at all for a first Pelican Hub event. It says there is a hub in Detroit, Michigan. Any idea who the Hubmaster is along with contact information? While the Hubs have been choosen and attendees notified, I don’t believe that the Hub masters have been announced yet. I’m hopeful that it won’t be much longer because it takes time to select an appropriate location. Once the Detroit Hub Master is choosen, they will be in contact. In June & July, received emails from Pelikan looking for HUB Master for San Francisco. Been wondering if the event will happen in SF. Today I am so pleased to receive an email from Paulo Buencamino & Ernestine Chua. They are willing to be the HUB Masters. The best is the event will really be in SF (No complaint but last year SF Hub was actually in the city of Millbrae). A word of appreciation to all the HUB Masters, past & present, for stepping forward – so that all of us have a wonderful evening sharing the pens and stories with our fellow Pelikan enthusiasts. Glad to hear that San Francisco is in good hands and thanks for sharing the Hub Master love. Enjoy the event. It’ll be here before you know it. Does anyone know how to contact the hubmaster for Nashville? I think if you write back to Pelikan HUBs , they will connect you. Last year I was mistakenly grouped to a wrong location (country), I sent hubs@pelikan.com an email, they resolved the issue immediately. Hope this helps. Your best best is to email hubs@pelikan.com. The Pelikan team will then be ale to put you in touch with the hub master you seek. Good luck tracking them down. Dear Joshua, you have my greatest appreciation and admiration for your enthusiasm and selflessness. Philadelphia is very fortunate to have you as HUB master. Events such as this are time and energy consuming to organize. I know I could never pull off anything like this, and I admire people like you who could. While I am looking forward to tomorrow’s HUB event in my location, I also eagerly look forward to reading your write up of your Philadelphia gathering. It was great fun last year I just enjoyed all the wonderful comments people wrote back to you, and I am sure you will have equally a great time this year (and hopefully you will do many more in the future). Thank you, Joshua. I hope that you were able to enjoy your Hub to the fullest. My review is now up for you to look over. I appreciate your kind words. Our Hub was just awesome and I really enjoyed getting to talk pens with like minded enthusiasts.